usually if there’s something special-ish for breakfast at home on the weekends (special meaning something besides toast, oatmeal or yogurt), it’s going to be omelettes, challah french toast or alton brown’s pancakes, made by my dad. on christmas morning, 99% of the time it’s this french toast casserole (basically cinnamon toast bread pudding). 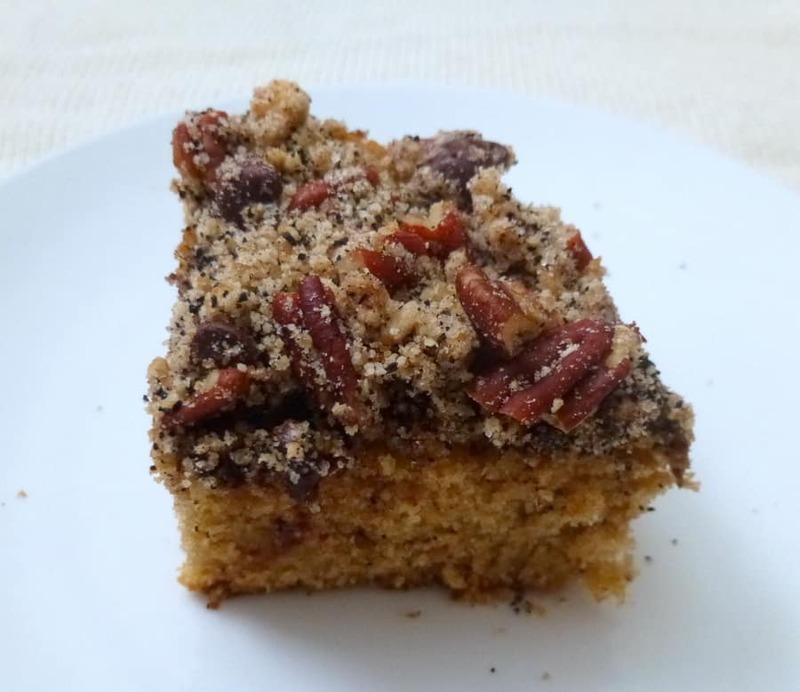 the rest of the time is up in the air, and this was one such occasion, perfect for coffee cake. moist and tender. it had a tight crumb and was a little dense, but that’s how i like it. there were crunchy bits on top where the cake peeked through the streusel, always a good thing. you couldn’t even taste the white whole wheat flour. there was something spicy, maybe even a touch fruity, that i couldn’t pick up on, even though the only thing i could think of doing that was cinnamon. which i recognize. the crumble is the main flavor component, and i loved all the pecans and coffee and chocolate. it was super sandy and kept falling off the cake, though. a higher fat/dry ratio could work, or i’m leaning towards increasing the amount of cake surface area that the crumble touches (either by swirling it into the batter, or layering it within the batter). lmk how it goes if you try it! Grease a 9×9″ (8×8″ is fine too) pan and line the bottom with parchment paper. Combine the flour, sugars, butter and salt until the mixture resembles coarse meal. Transfer 3/4 cup to a small bowl. Stir in the nuts, chocolate and espresso for the topping. Sprinkle the baking soda onto the remaining flour mixture; add the buttermilk, egg, and extracts. Beat just until combined. Scrape into the prepared baking pan, spreading it evenly. Sprinkle the topping on top. Bake at 350F for 40 to 45 minutes, until the top of the coffee cake is golden brown and a cake tester comes out clean. Unmold when the cake has cooled. What a coincidence to find another food blogger from orange county ! I just randomly clicked on a blog from the foodie blog roll and found yours ! Cool recipes btw. And I agree, taste is definitely more important than looks. You had me at espresso!! coffee cake is a must try! i love it for brunch (or whenever i have a long day ahead and need a little something sweet in the morning). thanks for stopping by, david! I love espresso! It’s a mouth watering combination of chocolate and espresso! chocolate and coffee are always a sure bet together (: hope you get a chance to try this! As a coffee lover this post is very helpful for me. Anyways after looking your photos I am feeling hungry. Let make it asap by myself and taste it. Thanks for share it.